We cut to a table backstage at the GCW arena. As the audience begins to pour in to the stadium. There is a small studio room with a table in the centre and a big window that shows the arena. A small LCD screen sits behind the four chairs as out hosts walk in for tonight. Lola Sparkle takes centre seat, to her right it Clint Bishop in his signature blue suit. Lola: Hello folks at home! 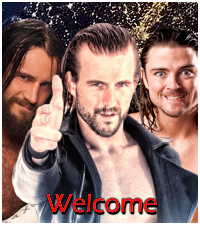 We are live for the GCW pre-show here at the GCW home arena, I am joined here by Clint Bishop! Say hi Clint! Clint: … Hello for you guys watching at home and you guys just entering the arena! Lola: That’s great! Tonight we will be joined by a special guest… the ever loveable Jensen! Jensen walks into the studio, dressed in his own homemade suit made from materials he gathered himself. He takes a seat to the left of Lola and nods to the camera. Lola: So we have a stacked card ahead of us tonight, but lets discuss our first match. 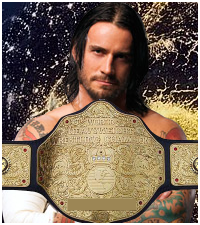 The US Title #1 Contendership Battle Royal. The critics have tipped Andrew Jordan to be successful here given his legitimate MMA background, something that is very rarely discussed around here. Clint: I can see why many would say Jordan, he is probably the most competent at fighting out of the lot of them. However, his MMA moveset typically only works in 1 on 1 bouts. I say that will limit him here. 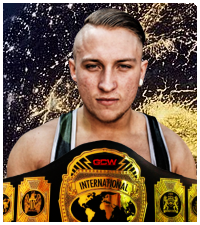 In my opinion the real big winner here will have to be Dan Henderson, he has bags of potential, if he can focus and put in a good showing I am certain he can go on to greater things in GCW. Lola: Well, I am getting word from backstage that everyone is in the ring and ready to compete, lets cut to the arena now for our over the top battle royal! The ring is filled with Steve Wolf, Thorn, Captain Rump, Andrew Jordan and Dan Henderson. The bell rings as the match starts. Instantly Wolf, Thorn, Jordan and Henderson turn on Rump and immediately push him to the ropes to try and push him over. There is a lot of back and forth pushing and shoving but all four men final push Rump over the top rope, sending him bouncing out of the ring. Fink: Captain Rump… has been eliminated! The crowd let out a small cheer as the rest of the competitors turn on each other. Wolf and Thorn instantly jump into punching each other. Henderson and Jordan nod at each other and instantly join in on the beatdown, leaping into the fray and turning it into n absolute shmoz. Suddenly Andrew Jordan pulls Steve Wolf aside and keeps repeatedly hitting him with the Dragon Combo. Dazed and confused, Wolf leans dizzily against the ropes. Jordan charges forward… DISCUS LARIAT! Wolf is sent tumbling over the top rope, bouncing painfully off the apron. Meanwhile, Henderson is preoccupied with Thorn. Thorn lifts up Henderson into a bear hug and drags him to the corner, With one swift move Thorn throws Henderson into the air and charges into him, pounding him into the corner. With that, Thorn picks up Henderson and tips him gently over the top rope. Turning around, Thorn is charged by Jordan who traps him in the corner, with repetitive Dragon Combo’s being dealt. Fink: Steve Wolf and Dan Henderson have been eliminated! Fink: Thorn, has been eliminated. Ladies and Gentlemen… your #1 Contender… ANDREEEEW JORDAAAAN!!! Sandstorm by Darude hits the speakers as Jordan celebrated in ring, the fans cheer for him as he raises both fists in the air victoriously. With that, Jordan has become the challenger to the US champion. We cut back to our studio where Lola claps happily whilst Clint looks on surprised and Jensen sits respectfully. Lola: What a match that was! I loved the part where they hit each other! Clint: So it’s the International #1 Contenders battle royal up next too right? Lola: That is correct, We will be seeing Kidd West, Kenji Yamada, Mason James and Sway Archer engaging in some in ring action! Clint: Its an exciting match no doubt. 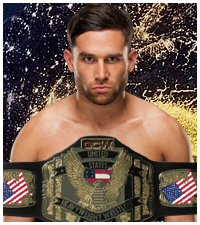 Kidd West is the most decorated superstar in the match having won several championships, given his lust for gold I have no doubt he’d be on course for yet another championship belt. But he has to compete with Kenji Yamada, an ace hot prospect who has been dominant in ring these last few weeks and could be on course to win his second championship belt! Jensen: Actually Lola… there is another competitor in this match tonight. Jensen stands up and rips off his suit in one smooth pull revealing his ring gear. Lola looks on surprised as Clint has a smile on his face. Jensen walks out of the studio. Clint: This is about to get real good. Kidd West, Mason James, Kenji Yamada and Sway Archer stand in the ring waiting for the bell to ring. Suddenly ‘The Pines’ by Portugal. The Man. Hits the speakers as everyone in the ring turns around and looks in surprise. Jensen steps onto the stage to rapturous applause from the surrounding GCW fans who are going mental and screaming. Jensen smiles as he makes his way down to the ring, climbing up onto the apron, he turns to face the fans and closes his eyes to just absorb and take in the applause before entering the ring. Fink: Mason James has been eliminated! At the sound of this, Mason James roars and chases after both West and Archer who run opposite directions to confuse Mason James. Jensen and Kenji are watching on these shenanigans, both men looking at each other exasperated at the current events. Mason James gives up and storms off backstage. West and Archer rush back into the ring and rush at Jensen and Yamada who instantly begin to trade blows with them. Yamada slides between the legs of Archer, tripping him up and sending him face first into the mat. Kenji repeatedly stomps into Sway Archer, trying to keep him down. Meanwhile, Jensen is relentlessly pushing back West with continual flurries of blows to his chest. Jensen Irish Whips West into the ropes… Slingblade! Jensen, picks West back up and tries to eliminate him, lifting West over the top rope. West struggles and struggles before tumbling over, quickly grabbing the bottom rope and clinging on for dear life. Jensen and Kenji immediately lift up Archer. Both men nod at each other as Jensen quickly acts to hit Archer with the Censored Colours, taking out Archer and leaving Kenji open enough to hit the Drop The Bass! With Archer taken out, Kenji tosses him over the top where he lands with a thud to the outside. Kenji and Jensen high five, but suddenly Kidd West Springboard Flying Clotheslines into scene taking down both Kenji and Jensen. In a quick rush before both men can get back up, West runs to make a Springboard moonsault. As he springboards, he is caught in the air by Jensen who quickly tosses West over the rope to where he hits the ground and is eliminated. Fink: Kidd West and Sway Archer have been eliminated! With only Jensen and Yamada remaining. Both men shake hands and walk to opposite sides of the ring. Jensen and Kenji rush at each other, Kenji making the first move and hitting the Diving Crossbody onto Jensen, knocking him down. Yamada gets up and fist pumps, but Jensen has gotten up behind him quickly and whips him around, hitting him with the single arm DDT. Yamada dazily gets up as Jensen hits him with a shotgun dropkick, propelling him into the ropes. Jensen quickly rushes behind Kenji and tosses him over the top. There is a roar from the crowd as The Pines hits the speaker as the crowd go wild for Jensen. 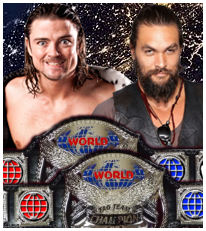 He carefully climbs up the turnbuckles and raises a fist in victory as he is named the new #1 Contender for the International Championship. Lola: Wow!!! Jensen looked awesome! Clint: Very much, what a great return for the former International Champion of GCW. I hope he turns in some great performances! Lola: So its time for our inaugural womens match! Lynne Samuels makes her debut here today as she aims to conquer the growing Womens Division of GCW! Clint: Talk about a Womens Revolution! Lola: Very much so, I will now hand us over to Beast Jackson and Terry Kohl who’ll be looking to commentate their first match of the night! Bye from us! The camera cuts to the ringside commentary booth, Beast Jackson and Terry Kohl smile and nod. Kohl: Thank you Lola! Here come the women now! Fink: The following match, is a fatal four way match, to crown the first ever, GCW Women's Champion! Ayumi makes her way down to the ring, waving to fans. Fink: Introducing, from Tokyo, Japan, Ayumi! She slides into the ring and raises her arms. The bass of "Deeper, Deeper" starts playing and Jessica emerges from backstage, head down and hooded with her arms stretched out. As soon as the scream starts, Jessica flips her hood off and hypes the crowd up with her arms. Fink: Her opponent, first, from Dublin, Ireland, Jessica Allan! She makes her way to the ring while high-fiving the crowd all the way down. Once she is on the apron, she screams as the crowd cheers more. Jessica makes it to the centre of the ring and raises her hands once again before waiting for her opponent or the start of the match. "Fire of Unknown Origin" begins and the lights turn red. As the lyrics begin, Camber walks out with her head down. Fink: And from Sydney, Australia, Camber! Following Camber is a path of fire which stops right before she gets to the ring. She walks slowly up the ring making sure to wipe her feet on the apron before stepping inside. The lights in the GCW arena go out and the opening notes of "Next Contestant" are heard. Each night seems like its getting worse"
Two blue strobe lights start searching the crowds of the Arena. It happens every night she works"
The lights both snap to the stage where Lynne Samuels is standing with her hands on her hips and a smirk on her face. By her side, Her cousin, Cecily. Fink: Finally, from Queens, New York, accompanied to the ring by Cecily, Lynne Samuels! The girls make their way down the ramp, as Lynne's music blares through the speakers. When they reach the ring, Lynne walks to the further turnbuckle and climbs to the top, sitting on it facing the crowd. She fluffs her blonde hair and winks to the crowd before flipping backwards off of the turnbuckle into the ring. Lynne walks to the middle of the ring and winks again, Cecily by her side, before her music fades and the lights come back on. Kohl: GCW history will be made tonight, with the first ever GCW Women's Champion! The four competitors stand in the ring, sizing each other up. Fink: Now, introducing the special guest referee! The echoes of "black sheep, come home" begin to bellow through the arena. The guitar chords ring through the arena, the spotlights swirl, and they converge on the stage, where Maricia stands. Fink: Your special guest referee for this match, from Monaco-Ville, Monaco, Maricia Coucheaux! A smug smirk creeps across her face, and she motions to her ref shirt before strutting down to the ring. Every guitar chord sends a flash of light through the audience. She steps into the ring as the chorus starts, and the lights begin to shine in a rainbow of colours. 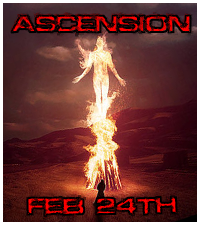 She steps over to the corner, and stands on the middle rope, arms outstretched, the smug smile never leaving her face. Kohl: What a shock! Maricia Coucheaux is going to be the guest referee for this match! She steps down, the music fades out, and she stands in the centre of the ring. The ring assistant hands her the belt, and she hoists it up the title, before handing it back off. Beast: Why wasn't she in the match?! Maricia stares down each of the competitors, shakes her head, and calls for the bell. Kohl: The match is underway, and there's a stiff kick to the stomach from Yumi! Yumi lands a flurry of kicks on Jessica in the corner, and winds her with a big front kick to the chest. Beast: Jessica rolling out of the ring here to stop that onslaught, smart move! Jessica rolls to catch her breath on the outside, and Yumi turns back to face her opponents. Lynne and Camber both look to each other, and Lynne quickly rolls out of the ring. She yells 'you two deal with it! I'm not fighting yet'. Beast: No Kohl, not a brave move, but a smart one! Camber goes to lock up, but Yumi ducks the attempt, and grabs a rear waist lock. Camber quickly snaps out, and reverses into a rear waistlock of her own. Yumi rolls to the side, and plants Camber with a drop toe hold, before mounting her with a front facelock. Camber reverses it, dropping Yumi to the mat, and grabbing a wrist lock. Yumi cleverly reverses the wrist lock, putting one of her own on Camber. Camber rolls forward and goes to kip up, but as she does, Yumi hits a strong kick to the chest. Kohl: Beautiful sequence there, cut short by another vicious strike from Y-- wait! Dropkick from Jessica Allan! While the chaining was going on, Jessica was slowly scaling the top rope, and after Yumi hits the kick, Jessica lands a stiff dropkick to the back of Yumi's head. Yumi rolls out of the ring in pain, and Jessica flops onto Camber. Beast: 1 -- no, quick kickout from Camber! Jessica stands from the pin, and Lynne Samuels quickly throws her out of the ring. Camber stands, and is quickly put back down by a DDT from Lynne. Kohl: Lynne taking some time to gloat here, not a wise move with so many competitors! Lynne stands on the middle rope and fluffs her hair, bragging to the crowd, when all of a sudden, Jessica pushes her off. Jessica turns her focus back to Camber, and goes to attack her again. Kohl: Jessica with a haymaker, Camber ducks in, snap german suplex! Camber hops to her feet, enraged, she snatched Jessica up, and sets her up for a Dragon suplex. She lifts Jessica, but Jessica counters the suplex into a victory roll. Beast: Clever pin from Jessica Allan! One--Two--kickout! Kohl: Very close pinfall attempt! This match is amazing! Beast: I personally think Maricia counted a bit slow there! Camber stumbles to her feet, and is met with a buzzsaw kick from Jessica. Kohl: A wicked kick from Allan! Beast: She must have learned that from Kenji! Camber crumbles to the mat, and Jessica rolls her over for the cover. As Maricia goes to count three, Lynne drags Jessica out of the ring, and whips her head first into the barricade. Beast: Sheer aggression from Lynne Samuels! Jessica might be knocked out! Camber slowly rises to her feet, as Lynne taunts Jessica on the outside. Kohl: Lynne could be taking advantage here, but she's showboating again! Camber rolls out of the ring, and starts brawling with Lynne on the outside. Meanwhile, Yumi is climbing the top rope. Beast: These two just slugging it out over Jessica Allan's unconscious body! I love it! Kohl: Beast, look, Yumi's up top! Yumi turns, and goes for a moonsault on Camber and Lynne. At the very last second, Camber dives out of the way, leaving only Lynne to get hit with the moonsault. Beast: Camber got out of the way! This may turn things around for her! Yumi staggers to her feet, and Camber quickly hooks her with a Dragon Suplex, before lifting Yumi, and slamming her neck first onto the apron. Kohl: Yumi's neck might be broken! My god! Beast: This is great Kohl! The women of GCW are ruthless! Camber drags Lynne by her hair, and throws her into the ring. Camber slides in, and kicks Lynne hard in the stomach. She slides over Lynne for the pin. Beast: One! Two! No! Cecily just dragged Maricia out of the ring! Maricia stares down Cecily, before slowly composing herself. Kohl: Is Maricia gonna let this go?! Maricia chuckles and then her smile turns into a scowl. She simply turns to a security guard, and points to Cecily. The crowd erupts. Beast: Maricia just ejected Lynne's cousin! Our special guest referee taking no prisoners here! Cecily gets dragged away by the security guard, kicking and screaming. Kohl: Serves her right! She may have just cost Camber the match! Camber shakes her head at the display, and turns around right into a small package from Lynne. Maricia slides in and counts, but only hits a two count. As the two competitors rise to their feet, Camber hits a European uppercut, flooring Lynne, and she quickly follows in up with a senton. Kohl: Camber might be closing in on the victory here, yet again! Camber rises to her feat, and let's out a war cry. She lifts Lynne, and goes to hook her with the dragon suplex, but Lynne struggles, and pushes Camber at Maricia. Beast: Lynne just pushed Camber directly at Maricia, and Maricia is livid! Camber stumbled forward after colliding with Maricia. Maricia, fuming, superkicks Camber in the back of the head. Camber faceplants, and Lynne looks up to Maricia, her mouth agape. Kohl: Maricia just decked Camber! Lynne is gonna steal this! As Maricia is fixing her hair, still angry, Lynne rolls Camber over. She quickly hits the "DAYD", and then climbs to the top rope. Kohl: Lynne Samuels on top now, looking for something here! Lynne dives off and connects perfectly with "Simply Beautiful". She rolls over and hooks the leg for the pin. Maricia looks down, and reluctantly counts a slow pinfall. Kohl: The first ever GCW Women's champion! Lynne Samuels! Lynne springs to her feet and cheers as her music starts up. Maricia walks over to the corner with the title, still pissed. She snatches the title from the bell keeper, and turns to Lynne. Cecily starts walking down the ramp, cheering. Beast: Look at this, a nice family celebration! Lynne holds her hands out, grinning from ear to ear. Maricia flashes a fake smile, and shoves the title into Lynne's chest. Lynne turns to Cecily, beckoning her to come in the ring. Beast: A W is a W Kohl! --who cracks Lynne in the side of the head with a spinning heel kick. Cecily stops dead in her tracks, and double takes between Maricia and Lynne. Kohl: Maricia just damn near decapitated Lynne Samuels! Maricia stares down Cecily, before kneeling down, grabbing the title, and hoisting it over her head. Beast: Maricia Coucheaux just made her mark on the women's division, spoiling the victory of Lynne Samuels! Kohl: A great match for Lynne, soured by a horrendous blindside from Maricia.